Working out feels less like work when it incorporates a fun excursion or a new pastime. To prevent fitness routine boredom, think outside the gym. These events are the ultimate summer activities for exercise enthusiasts of all levels to get outside and get active. 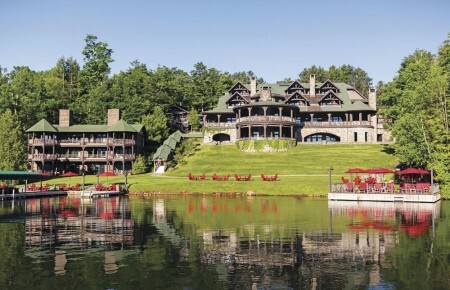 Travel by land and sea (or rather, bay) for a double dose of summer scenery. 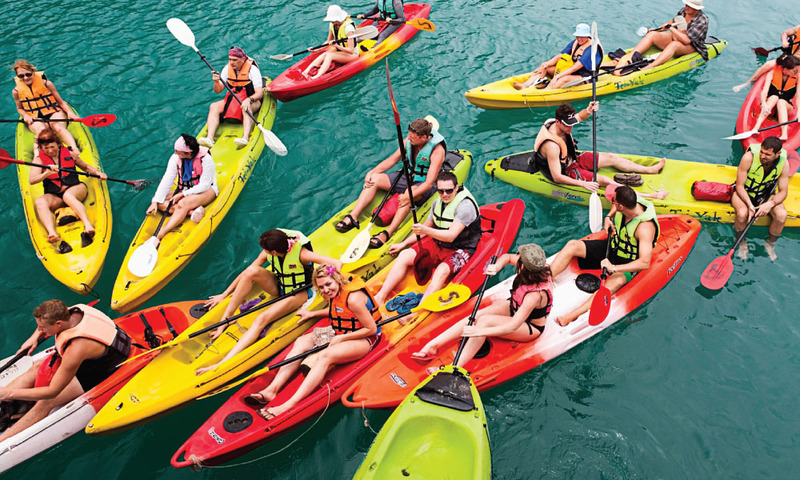 The bikayak (bike + kayak) tour, encompasses a 25-mile bike ride along Long Beach’s barrier island and a 3-mile kayak paddle in the bay launching from Island Park. Bring a bike and a helmet (kayaks are included) for this full-body workout on Sept. 13 at 8am. Hitting the links is a perennial summer pastime, but how many avid golfers can say they’ve enjoyed a “good walk spoiled” at night? At Heartland’s lighted nine-hole course players can try their hands at replicas of the world’s most famous par 3 holes, from Augusta to Pebble Beach. Tee times are available as late as midnight through September. There’s something undeniably freeing about flinging color with wild abandon like a child let loose with finger paints. 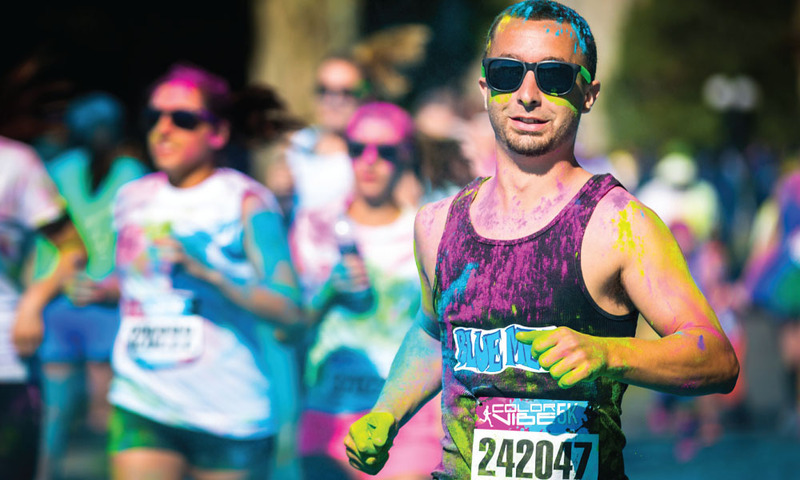 The Color Vibe 5k harnesses this frenetic energy into a rainbow- tinted run and dance party where participants get crazy throwing colored powder. Runners (and walkers) are encouraged to dress all in white as a blank canvas for the splatters to come. The race takes place on July 11, starting at 9am. Latin night heats up as the sun goes down every Sunday at this landmark. All summer long, salsa and merengue music fuel a seaside dance party starting at 7:30pm. Even a novice can learn the basics with some simple instruction from the band. Watching the experts at work will step up the skills in no time. Communing with nature is especially intoxicating when the magic mixture of sunset, stars and SUP are combined. Paddle Divas in East Hampton arranges two-hour full moon paddleboard tours starting at 7:30pm, perfectly timed to take advantage of both sundown and a star-filled sky. After the tour, participants are invited for refreshments on the beach. Tour dates are July 1, 2, 3 and 30; Aug 1, 29 and 30. The ancient Chinese art of tai chi helps reduce anxiety, improves balance and stretches the muscles. Mental health is just as important as physical health, de-stressing through a combination of calming movements and a serene water view makes for one tranquil morning. Every Saturday, from June 6-27 and Aug 8-29, tai chi devotees gather at Shorefront Park in Patchogue at 9am. Go ahead, get zen. Sliding through a wall of fire into a pool of mud. Running between dangling live electric wires. Crawling in a tunnel filled with a “safe” tear gas-like substance. No, these aren’t cruel and unusual punishments—they’re obstacles in the Tough Mudder. Daredevils can test their grit on this 10-mile+ obstacle course where the focus is not on finishing first, but working as a team. Mudders pledge to leave no one behind, helping each other through in the ultimate test of camaraderie and mental fortitude. Start times are assigned per group on Aug 15 or 16. For the jacks of all trades (or gluttons for punishment), the triathlon is the ultimate test of endurance and athleticism. But seaside scenery and quaint small town vistas can perhaps make the difficult feat a tad more bearable. The Runner’s Edge TOBAY Triathlon on Aug 30 takes participants on a 1⁄2-mile swim through Oyster Bay Harbor, followed by a 15k bike ride through Laurel Hollow and Cove Neck and finishes with a 5k run culminating at Theodore Roosevelt Memorial Park. Paddleboarding is already a great way to improve balance and strengthen the core, but throw in planking and squats and even experts will be sweating. At Huntington SUP, weekly classes allow SUPers to test their strength while afloat in Huntington Harbor. Sunday mornings at 9am, participants paddle out on their boards and experience a full-body workout atop the water. What could be more relaxing than a summer sunset yoga session? One followed by a glass of wine with a side of jazz! At Wölffer, some of the Hamptons’ most revered yogis hold classes among the vines Wednesday through Sunday. To take full advantage of the setting, the Thursday night Sunset Salutations class at 6pm is followed by a stop in the tasting room, where there will be vino and live jazz flowing until 8pm.